Some people perform better under pressure. It turns out that a little bit of pressure may help relieve certain cancer symptoms and treatment side effects. Acupressure — a form of massage that reportedly originated in China before the Common Era — can alleviate nausea, fatigue, pain and anxiety, research shows. It involves applying pressure to points called acupoints throughout the body to stimulate healing. It is a form of self-massage. Even though acupressure is less widely known than acupuncture in the U.S., acupressure predates acupuncture. Before needles were invented, ancient cultures used sharp stones for acupuncture. Before sharp stones were used, people used fingers to apply pressure to acupoints. Most studies on acupressure and acupuncture in cancer care indicate the therapy is helpful at palliating certain symptoms. One of the perks of acupressure is that it can be self-administered at any time, in any location. Acupuncture requires a licensed practitioner and the use of needles, making it an invasive procedure, albeit a minimally invasive one. Acupressure is less commonly offered in cancer centers than acupuncture, but practitioners are found throughout the country and books on acupressure teach people how to effectively self-apply the therapy. A number of cancer centers now offer acupuncture as a complementary treatment. For example, the Dana-Farber Cancer Institute has offered acupuncture since 2000 and is leading the way in standardizing protocols for oncology acupuncture. The cost of acupressure is often lower than acupuncture, especially if you take the self-taught approach. An acupressure session with a trained practitioner can cost $50 to $95, while acupuncture sessions may cost $75 to $125. Once you learn acupressure points that work for you, it is easy and free to apply the therapy yourself. Self-administering acupressure is easy and safe for people with cancer. You’ll want to use your fingers to apply steady, prolonged pressure for at least three minutes per acupoint. Applying pressure in a circular motion may enhance effectiveness for some people. The degree of pressure you’ll apply will vary by acupoint. You want more pressure than light touch offers, yet not too much pressure to cause bruising or pain. Acupoints that reside around developed muscle tissue will require more pressure. Some points may feel more sensitive than others; apply less pressure to sore or sensitive points. You can apply pressure for as long as you want to control symptoms such as nausea, pain or anxiety. Ideally, you’ll want to sit or lay in a comfortable position when performing acupressure. Take several relaxing, deep breaths before you begin. Place your focus on breathing and try to relax. Position your hand so that your palm is facing you. Relax your fingers. 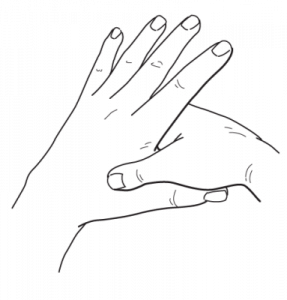 Place the first three fingers of your opposite hand across your wrist, aligning your ring finger with the wrist crease (Figure 1). 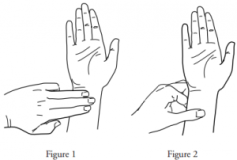 Next, place your thumb below and slightly under your index finger (Figure 2). The thumb should be centered on the wrist and you will feel two prominent tendons underneath. That is acupoint P6. Apply firm pressure to the acupoint for at least three minutes. 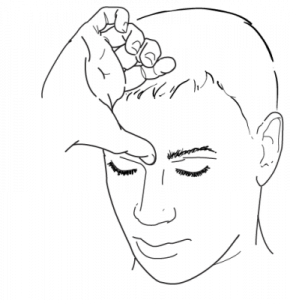 Position your hand with your palm facing down. Gently spread your fingers. Use your opposite thumb and middle finger to find the slight indentation between the base of your thumb and index finger (see figure). That is pressure point LI4. Apply firm pressure to the acupoint for five minutes. Side effects and complications from acupressure are extremely rare. If someone presses too hard on the acupoint, bruising can occur. That may happen more easily for people undergoing chemotherapy. While studies have proven the benefit of acupressure and acupuncture for cancer patients, there are no standardized protocols for how to use the therapy for specific symptoms. Different practitioners may use different acupoints to treat the same symptom, which could be further studied to see which points work best for various symptoms. Acupressure could play a more prominent role in the future of integrative cancer care as promising research continues to surface. Free information about alternative mesothelioma treatment, books, support, wristbands & more. A 2007 clinical trial found acupressure and acupuncture generally effective at relieving cancer-related fatigue (CRF) after chemotherapy, but acupuncture offered greater improvement. The group receiving acupuncture reported a 36 percent improvement in CRF, the acupressure group reported a 19 percent improvement and the placebo group reported a 0.6 percent improvement. A 2014 Taiwanese trial reported that acupressure improved fatigue, sleep quality and functional status of people receiving chemotherapy for lung cancer. Application of essential oils to the acupoints particularly improved sleep quality. A 2007 study found acupressure reduced the amount of vomiting and the intensity of nausea over time for people who received chemotherapy. However, acupressure didn’t significantly help vomiting or nausea immediately following chemotherapy. In fact, it delayed the effect. A 2007 British trial found that acupressure lowered the occurrence of nausea, dry heaving and vomiting and lessened the severity of the nausea and dry heaving following chemotherapy. Acupressure was applied to just one point on the wrist using a wristband such as the Sea-Band brand wristband available throughout the U.S. Participants who received acupressure had to wear the wristband for five days after chemotherapy began. The point, known as P6 or PC6, is located on the inside of the wrist, three fingers down from the wrist crease in the center. A 2007 Italian study found that acupressure could help chemotherapy patients who were not responding to anti-nausea medication. Pressure was applied to the P6 point and 68 percent of participants had a reduction in vomiting. A 2015 Turkish study found the P6 point effective at decreasing chemotherapy-induced nausea, vomiting and anxiety among breast cancer patients. A 2015 review of acupressure studies reported self-administration effective at improving nausea and vomiting for cancer patients, reducing symptoms of respiratory disease, relieving fatigue and reducing sleep disturbances. A 1996 study evaluated the effects of acupressure on post-operative pain and found it effective. The group that received real acupressure reported significantly lower pain scores than the placebo group. A 2014 meta-analysis of auricular acupressure, which is acupressure applied to the ear, found it effective at managing different types of pain, including post-operative pain and low back pain. Auricular acupressure also reduced the need for pain medicine before and after surgery. It is worth noting that acupressure may be less effective for cancer-related pain than acupuncture. A 2003 study of acupuncture applied to the ear showed a 36 percent reduction in pain among cancer patients who still had pain after taking pain medicine. A 2007 German study found acupuncture helped relieve peripheral neuropathic pain, a type of nerve pain that can result from chemotherapy, in 76 percent of participants. A 2005 Indian study found acupressure effective at reducing pre-operative anxiety, but the effects don’t last long after pressure is removed from the acupoint. Pressure was applied in a circular motion for 10 minutes to the Extra 1 point, which is located between the eyebrows at the root of the nose. Participants reported a significant reduction in anxiety, but their anxiety returned to baseline after 30 minutes. The results suggest that anxious patients can use this acupoint to temporarily reduce anxiety in medical settings and elsewhere. Dibble, S.L., Luce, J., Cooper, B.A., Israel, J., Cohen, M., Nussey, B., & Rugo, H. (2007). Acupressure for chemotherapy-induced nausea and vomiting: A randomized clinical trial. Oncology Nursing Forum, 34(4):813-820. Felhendler, D., & Lisander, B. (1996). Pressure on acupoints decreases postoperative pain. The Clinical Journal of Pain, 12(4):326-329. Lissoni, P. (2007). A progress study of 100 cancer patients treated by acupressure for chemotherapy-induced vomiting after failure with the pharmacological approach. Minerva Medical, 98(6):665-668. Ling, M. (2009). Acupuncture as a complementary therapy in chemotherapy-induced nausea and vomiting. Baylor University Medical Center Proceedings, 22(2):138-141. Ling, W.M., Lui, L.Y., So, W.K., & Chan, K. (2014). Effects of acupuncture and acupressure on cancer-related fatigue: A systemic review. Oncology Nursing Forum, 41(6):581-592. Lu, W., Dean-Clower, E., Doherty-Gilman, A., & Rosenthal, D.S. (2008). Acupuncture in cancer care at Dana-Farber Cancer Institute: An integrative medical practice. In L. Cohen & M. Markman (Eds. ), Integrative oncology. Totowa, NJ: Humana Press. Molassiotis, A., Helin, A.M., Dabbour, R., & Hummerston, S. (2007). The effects of P6 acupressure in the prophylaxis of chemotherapy-related nausea and vomiting in breast cancer patients. Complementary Therapies in Medicine, 15(1):3-12. Molassiotis, A., Sylt, P., & Diggins, H. (2007). The management of cancer-related fatigue after chemotherapy with acupuncture and acupressure: A randomized controlled trial. Complementary Therapies in Medicine, 15(4):228-237. Schroder, S., Liepert, J., Remppis, A., & Greten, J.H. (2007). Acupuncture treatment improves nerve conduction in peripheral neuropathy. European Journal of Neurology, 14(3):276-281.